Task: To optimise picking and packing processes under controlled food-grade conditions by utilising a range of FANUC robots. Solution: By introducing a sophisticated system of FANUC robots, A-ware have achieved impressive results at their cheese plant in Zeewold, the Netherlands. 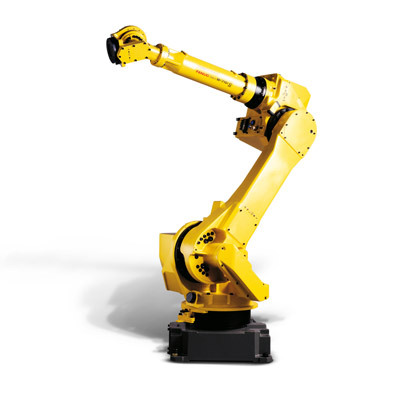 FANUC robots are responsible for everything from weighing and cutting portions of cheese with precise accuracy through to high-speed packaging and palletising, and all under strictly controlled food-grade conditions. Result: Considerable improvements in overall productivity and cycle times due to extended work capabilities and increased reliability. A-ware in Zeewolde has been working with Robertpack for two years now. The packing specialist from Zeewolde supplied machines with integrated FANUC robots. The super-fast robots ensure that portions of cheese are quickly and efficiently packed and palletised. A-ware Food Group is an organization that specializes in maturing, cutting, packaging, storing and transporting of cheese and other food products under controlled conditions. This family company was created in 2010 by merging together Anker Cheese (1962) and Bouter Cheese (1890). Anker Cheese has become an international cheese company. In May 2010, the activities of Anker Cheese were split up into two 'new' companies: Anker Cheese (commercial activities) and A-ware (warehousing and logistics). In June 2010, A-ware acquired Fresh Support, an independent service provider in the field of packaging, particularly of cheese. Bouter Cheese is focused on the processing of Dutch and foreign cheese: mature, cut, package, distribute - to the largest retailer in the Netherlands, among others. After the merger, the company has gone further than the A-ware Food Group, with a large number of branch offices and around 1,600 employees. And the Group continues to grow. Schipper Cheese (Zaandam) was also acquired just last year and A-ware itself has recently decided to build a cheese factory in collaboration with Fontera, the New Zealand dairy cooperative. The plant became operational in 2014. In the establishment at Zeewolde, the Packaging Management spoke with Annelies Vander Hulst, Marketing Assistant at FANUC, Robert van Dien, Head of TD at A-ware, Eric van Houwelingen, Project Manager at A-ware and Bertus Visch, Project Manager at j Robertpack, about the use of robots for packaging and palletization of cheese pieces. Earlier, the robots used to be standalone devices’ says Bertus Visch. ‘Now we install them in the packaging machines, because that lets you achieve complex machine movements. This is certainly an absolute need at A-ware, where you have to deal with high speeds. If vision and line-tracking are important, FANUC is our choice. Annelies Vander Hulst confirms the increase in the use of robots. We supply through the machine builders and system integrators and we see that robots are often integrated in the machine itself for the sake of efficiency, cost-saving and safety. At A-ware in Zeewolde, the round, matured cheeses are cut into pieces accurate to a gram (E-code), seven days a week in 3-5 shifts and subsequently packed. This takes place on 15 lines, of which four have robots. The two robots above the deep draw machines of the new line (food-grade FANUC M3iA/6S) pack the formed cheese pieces in the two tracks and place them at high speed (120 pieces per minute), without letting the cheese come to rest, in the deep draw package, which is subsequently closed. The case loader is a machine completely built by Robertpack, comprising 2x FANUC M3A/6S robots for the box loading, under-box erector, tray edge closer and a lid setter. At the end of the line, a standalone FANUC M-710C/70 robot palletizes the boxes. The BRC, IFS, Skal and HACCP certified company complies with the highest quality standards in the industry. 'The Tools and the programming are an important factor when choosing a supplier’, says Van Houwelingen, who indicates that ever more robots are often offered a robot solution. Visch says that Robertpack has a lot of experience with the hands of the robots, which are produced in their own factory. For Van Dien and Van Houwelingen, what is most important is that everything works smoothly. ‘We have five suppliers in one 37 meter long line with a high and a low care part and the most crucial is that the machines talk to each other,’ says Van Dien. Van Houwelingen feels it is important not to bring in too many brands of robots into the works. Our experience with FANUC is good and working with the same brand of robots is an advantage as far as maintenance and knowledge are concerned.